Autumn is that perfect time of year. Summer’s heat is behind us and night time temperatures are delightfully cool. The sun has settled lower in the sky giving us azure skies and long shadows that delineate the canyon’s mesas and pinnacles from one another and make for wonderful photographs. Unfortunately these conditions also make it ideal for the fire managers of our forests to resume their burning projects to rid them of overgrown undergrowth and piles of cleared brush. All this is done to help prevent catastrophic wildfires that plague us every spring and summer. So those lovely blue skies will be filled with smoke at while the various prescribed fires are conducted. 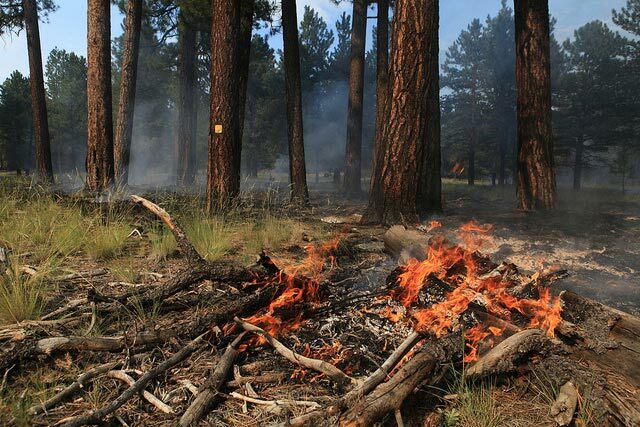 Both the Coconino and Kaibab National Forests which surround the Grand Canyon are conducting management fires now. You can find the latest updates on my Fires / Prescribed Burns / Smoke Status in Park page. I report if the smoke is settling into the Canyon and if it might impact the quality of your hike. The prescribed burns usually don’t produce too much smoke as they try to control how big the fires become and make sure the smoke will blow out. This doesn’t always work out, but that’s the plan. 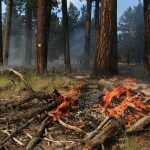 The U.S. Forest Service provides a newsletter so you can receive updates on prescribed burns as well as other news. I find this extremely helpful. You can get it for the Coconino National Forest and the Kaibab National Forest as well as other choices by going to Forest Service Information – Electronic Mailing List and selecting your preferences. I wish they had it for even more forests! Most of the larger burns seem to happen in the fall since our wind is more settled at this time than it is in spring. I would expect we’ll see burning even through the winter as they burn the piles of debris they’ve built up. So time to get used to the smoke and hope it does what it is meant to—prevent wildfires!